The PIN Genie Smart Lock, the first peep-proof and hidden camera-proof PIN pad that enables users to input their password without unwanted surveillance, this week announced they have secured their 4th U.S. patent, solidifying their ownership of the new smart lock industry. Founded as a much safer way to help people keep their pins protected and safeguarded, the PIN Genie Smart Lock randomly distributes the 10-digits, zero to nine, into four buttons, shuffling all of the numbers after each individual use. It’s the only smart lock on the market that is equipped with such a high-security PIN pad. This is especially important with home security. With the traditional pin design and usage today, people open themselves up to surveillance from hundreds of yards away. One singular pin can be easily observed and remembered, for reentering the property at a later date. PIN Genie makes PIN theft a thing of the past as it is the ultimate solution for smart home security. PIN Genie can be applied to a variety of scenarios, first testing out the product with mobile security worldwide. After 3 million users found the technology helpful, the PIN Genie is being used in a variety of settings. Most smart locks share through Wi-Fi for convenience, but most people do not realize it is insecure and can easily be hacked. PIN Genie built-in Bluetooth technology turns your smartphone into a gateway, which allows users to safely create temporary e-tokens using the PIN Genie free app (iOS or Android App Stores) and share with their guests. 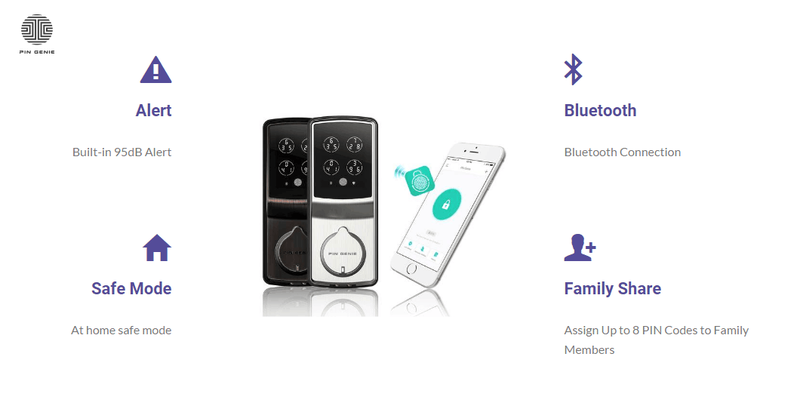 When the guest arrives at the house they can connect via Bluetooth and enter the e-token to pair the PIN Genie Smart Lock to gain access to the temporary codes. The passwords automatically expire according to the time the host sets. 256-bit encryption protects the entire process. This eases the worries in sharing physical keys with housekeepers and delivery drivers and having them being stolen and duplicated. Home owners can simply create temporary passcodes with expiration times on their smart phones. The PIN Genie Smart Lock comes with built-in alarms, at-home safe mode for disabling the touchscreen from inside..
As a startup founded in Silicon Valley, PIN Genie has been working for years to perfect this smart product. Their smart lock won the industry award of Hong Kong Electronic Fair, beating out several thousand competitors. Recognized as a device that will make a difference in people’s lives, the PIN Genie is a smart tech device that is making waves at competitions. PIN Genie was also successfully backed by 256 backers last year on Kickstarter, and received an invitation by Amazon personally to list the product. The product is now available for purchase on the eCommerce site as well. PIN Genie has developed a full range of products that include a Homekit version and an Alexa compatibility feature. As two integrated smart tech devices used by millions today, Homekit and Alexa, through PIN Genie, are voice commanded and activated robots with pre-programmed service capabilities. They are in the process of releasing a fingerprint version as well sometime in the beginning of 2018. 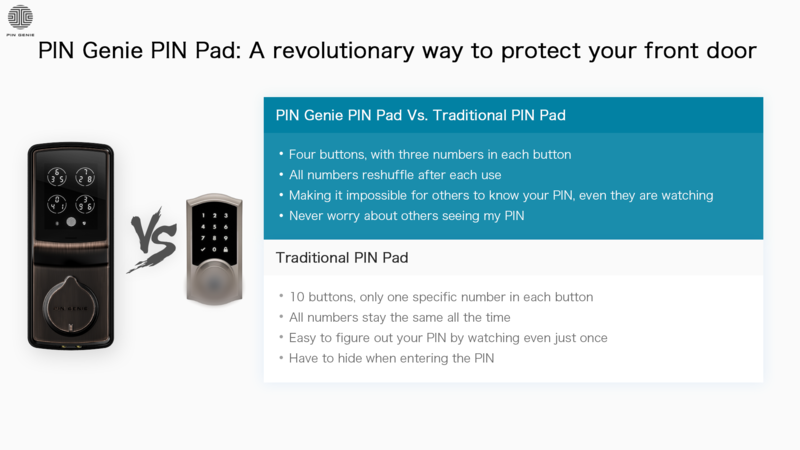 For more information, or to see the PIN Genie in action, visit: http://www.pin-genie.com .